Accent your kitchen by adding this stylish yet durable Vigo faucet. Stainless steel finish with matching deck plates all solid brass construction which ensures durability and longer life. Faucet features spiral pull-down spray head for powerful spray and separate spout for aerated flow. Includes a spray face that resists mineral buildup and is easy-to-clean. Stainless Steel Pull-Down Spray Kitchen Faucet with Deck Plate Accent your kitchen by adding this stylish yet durable Vigo faucet. Stainless steel finish with matching deck plates all solid brass construction which ensures durability and longer life. Faucet features spiral pull-down spray head for powerful spray and separate spout for aerated flow. Includes a spray face that resists mineral buildup and is easy-to-clean. 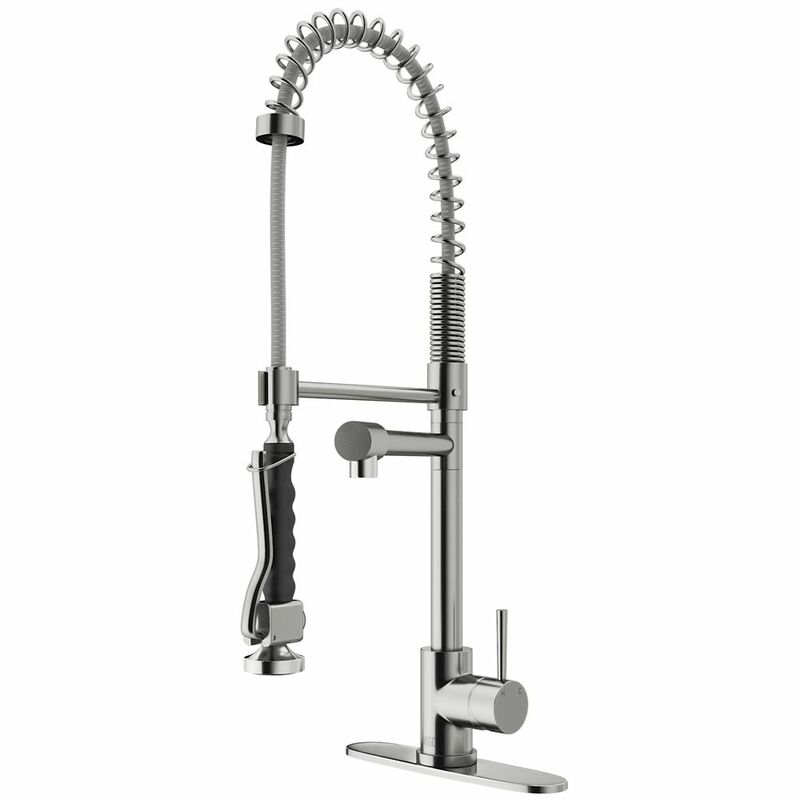 Stainless Steel Pull-Down Spray Kitchen Faucet with Deck Plate is rated 4.6 out of 5 by 408. Rated 1 out of 5 by JWF from The faucet itself is a good looking faucet and appears to be well built. The issue I have is wit... The faucet itself is a good looking faucet and appears to be well built. The issue I have is with Vigo custome service. They are horrible and difficult to deal with. We bought ours 3 years ago and it has work well until recently when the spray hose started leaking about 6 months ago. I contacted Vigo customer service and explained that the spray hose was leaking and asked if there is somewhere I can get a replacement part and being a contractor I knew exactly what part I needed. I requested a replacement part by number, they replied back asking for a receipt verfiying purchase. I explained that I did not have the receipt and want to purhase a replacement part again by number. They then requested a picture of the faucet so "they could sell me the correct part" even though I asked for the part by number. I sent them a picture of the faucet on March 1st and to date I have not heard anything from them. It is leaking so bad that I cannot use the faucet without it spraying wated all over. Since I have had no contact with them I have since had to purchase another faucet. This is a great faucet until you need parts for it. I would not buy one again knowing that if something went wrong with the faucet the problem would not get rectified in a timely manner. Rated 5 out of 5 by Mrs Sh from So far, so good! My husband installed this, and for a moment, there was some adjusting where there was water leakage out of the pot-filler when water was cold and I had the sprayer on. But when I turned to hot water and sprayer, the leaking in the pot-filler stopped. We thought about sending back, but we decided to keep using it, and somehow, the leak stopped and hasn't come back, so we are very happy about that. The sprayer works great. So far, there has been not problems for the 3 weeks we've been using it. Seems to be well made. Rated 5 out of 5 by Yendorj from Great design and finish I bought this faucet for my new kitchen with the idea of getting that "commercial look." This faucet hits the mark! The quality is amazing! Solid construction that is built to last. My only complaint is the pressure at the spray head. I would like to have greater pressure to blast food off plates. This isn't a deal breaker, but I would really like to be able to adjust the pressure by removing a restrictor, or whatever is slowing the water flow.